I was diagnosed with depression when I was 12. The first time, I was walking around the neighborhood with a bottle of pills. I tried to take a lot of ibuprofen at once but I took so many I ended up spitting them up. The second time I cut my arm with a razor. I felt trapped, I didn’t like my circumstances, I wanted to be free at a young age. I started going to therapy. After that my depression went away for a while. Then, in college I felt it come back and I felt at the time I wanted to go to therapy. Educating myself & working towards lofty goals. And of course achieving those goals. I would tell them to remove distractions. The senseless stemuli that we entertain. Id advise them to put only the healthiest of things into their psyche (like food). It looks like offering an outlet to care. To love on someone else with no regard to any limiting beliefs. It looks like offering book and seminar suggestions that keep the focus where it should be. What helps get you through difficult times? When I was going through my struggles with schizophrenia and depression, I stopped everything that I was involved in to see myself. I secluded myself and got into prayer, books, and finding the triggers that seemingly had me bound. Most of the time we just need a change in mind & routine to overcome. That's where the books & prayer comes in at. Reading, writing poetry, singing, being able to pour into others and make a difference any way that I can. 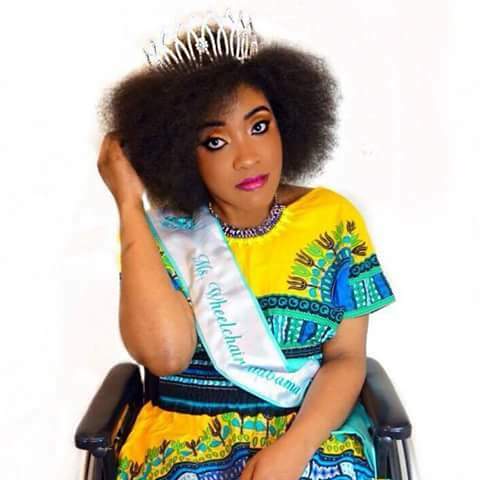 I'm a 23 year old Black girl that was born with Spina Bifida Myelomeningocele with Hydrocephalus. Spina Bifida is a neural tube defect where baby's spine does not develop correctly during the first 28 days of pregnancy. Congenital Hydrocephalus is a buildup of excess cerebrospinal fluid (CSF) in the brain at birth. The extra fluid can increase pressure in the baby's brain, causing brain damage and mental and physical problems. I'm blessed to be able to lead a pretty average life however, I've had to fight for it. 12.3% of the US population is African American and there are fewer than 200,000 US cases of Spina Bifida per year. So in a sense you could say I have almost felt in times passed twice the minority and twice the lonely. I'm the youngest of three girls. I've been the inspiration too many just by being who I am and there came a point where I hated that fact. It was not fair. I did not ask for this. I went through lots of different stages of life as we all do with that mind set silently and on occasion it led to suicidal thoughts and I am in a place now where I don't feel that I have to be a perfect picture of strength anymore. I realize that pressing on while openly going through is all the more inspiring. I mentioned that I am the youngest of three girls. My parents actually separated just around me turning 21 and my mother is a strong asset to a lot of needs I have with my disability. I've been learning to do a lot on my own slowly but surely since then and it is a bit of a different experience than the average person goes through. It's important for us all to not be too hard on ourselves disability or no disability. Just like my fellow man I desire marriage, children, a bomb career where I leave an awesome legacy and it's not easy. "It almost feels impossible for me at times as a 'doubly minority' but the joy of the Lord is my strength." Prayer is key for me when I feel myself becoming too anxious. I've learned to take the scripture that tells me to pray without ceasing extremely seriously. Also from the age of 9 when I would vent to God it would almost be tradition to write poetry after and much of those are now in my book "Sister, How Are You?" Another thing is honestly other people. Love really is my motivation because when I'm focused on a mentee or any loved one my problems tend to not bark at me so loudly. This is not to say that its healthy to ignore ones problems and become a slave to others. That's not what I am saying. I am saying when my thoughts lie to me and say I have no value and that I have no purpose and I can love on another I realize that love is my purpose. In simplest terms, what it looks like to help someone or a generation that may be suicidal overcome is just to care without limits. Too many times we have limits to our love for another. Romans 13:8 says, "Owe no man any thing, but to love one another: for he that loveth another hath fulfilled the law." and Galatians 5:14 says, "For all the law is fulfilled in one word, even in this; Thou shalt love thy neighbor as thyself." And it also says faith works by love. I could go on and on but basically what I'm saying is that there is no special formula. Caring is motivation for me in the Suicide Doors Conversation I host on social media and via conference call every year in September. Whitney's Advice: "I'd first tell them they're not alone. I'd then encourage them to just take time however long they can to just acknowledge their strengths and weaknesses as just them. Not good. Not bad. Just them. Nothing that God cannot cultivate." "My mental health story? It's odd for me to write this and honestly this has been a question that has stumped me for a while. I don't know the "proper" way to answer this question, but I'm going to give the most transparent answer I possibly can. So this past academic year has been really challenging for me due to many things that are not related to my academics."